Longtime sushi maven Chau Trinh is tickled pickled-ginger pink for the opportunity to wow hard-to-impress Winter Parkers. Trinh and his partner, Lou Waldman, also own a Sushi Pop in Oviedo. It’s all about raw fish at the new Sushi Pop restaurant near Park Avenue — but not in quite the way you’d think. Sure, you can order uncooked yellowtail nigiri or sashimi, just as you can at every other sushi spot in town. Yet, I suggest you go bolder. If it’s on the menu during your visit, try the belt fish (tachiuo), served atop seasoned rice bare or with a specially created fennel salsa. The striped bass known as suzuki might be a fun choice, too, served naked or covered lightly with sriracha salt and orange kosho, a citrus-chili blend. 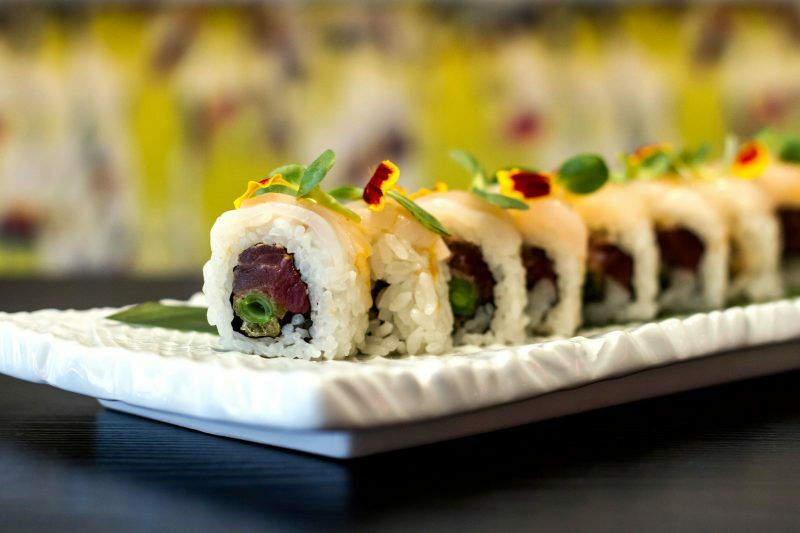 The original Sushi Pop, located in Oviedo, opened in 2011 and quickly won kudos from critics and diners alike for its innovative Japanese-fusion menu. And we do mean innovative. The concept’s creative leanings take a turn toward the raw here in town. 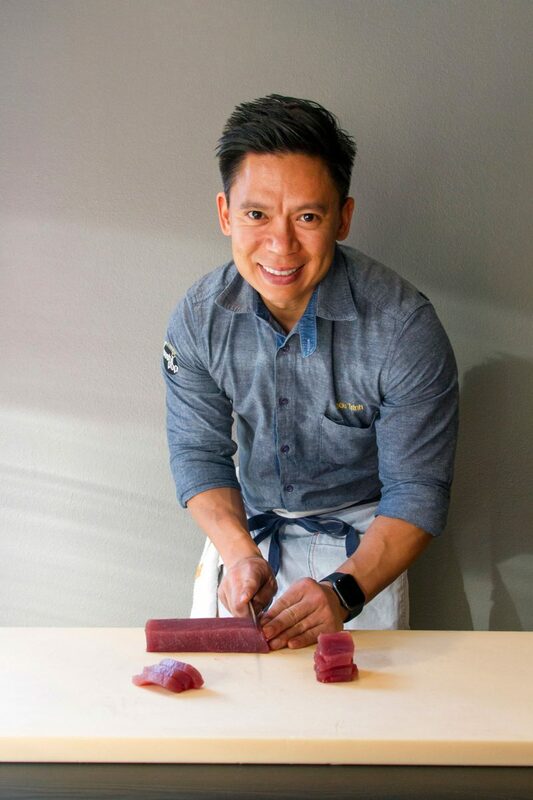 Longtime sushi maven Chau Trinh owns both Sushi Pops with business partner Lou Waldman. And Trinh is tickled pickled-ginger pink for the opportunity to wow hard-to-impress Winter Parkers. Indeed, well-traveled diners who are open to culinary exploration — like the folks who read this magazine — inspire the on-trend Trinh. That’s why he has turned this sleek and colorful Lyman Avenue eatery into a from-the-sea playground of sorts. For starters, Trinh imports Japanese fish-preparation rules along with the hard-to-source fish. More on those rules — which challenge certain long-held assumptions — in a bit. First, let’s order something. The perfect nigiri (raw fish on rice) or sashimi (raw fish without rice) begins with an ever-changing menu of sometimes-exotic choices. In addition to swimmers from Florida’s coasts and elsewhere — we’re talking New Zealand, Tasmania, you name it — the chefs receive a fish-filled box from Japan twice a week. Japachae-Pop uses potato-starch noodles and galbi secreto pork grilled at up to 800 degrees on a custom-designed gas-charcoal oven. The noodles, fresh vegetables and aged plum sauce — combined with tender pork — creates a rich, rounded dish. Trinh and his team examine the contents and start brainstorming about accompaniments. A light yet crucial enhancement such as ginger-shallot sauce, or bourbon-maple syrup with chives and smoked salt, might come to mind. Wait, did he say “cure?” Yes, he did. That resting time, he adds, alleviates the impact of wayward “adrenaline, hormones and rigor mortis” on the gilled creatures. In fact, many high-end sushi restaurants are now curing fish for six or seven days. “We’re doing that with some of ours,” notes Trinh. 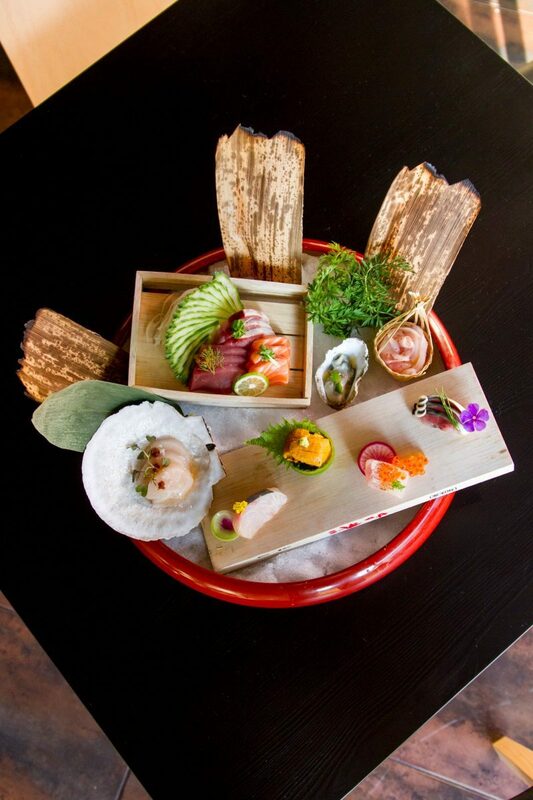 For an assortment of flavors, order the sashimi “moriawase.” It’s an assortment of raw treats made from what’s fresh in the kitchen during your visit. But if you’re not quite ready to forgo freshness, stick with us. Sushi Pop also offers foods you know and others that provide adventure without straying too far from familiar culinary territory. The “seaweeds” — a blend of three types — was fine. And Sushi Pop offers four types of flavoring for its edamame — typically nondescript green soybean pods for munching while waiting for the real food to arrive. Here, though, the edamame was nearly destination worthy. The hot beans were plump and vibrant and sprinkled generously with a granular blend of garlic and shichimi pepper — also called shichimi togarashi. The combo was exciting yet not overwhelming. After that, the next four dishes could be described as follows: Wow, wow and wow. Take the Madai Tasting, for example. Madai is sea bream, here sliced so thin as to be translucent then placed tenderly in a bowl with chips of purple-skin potatoes and slender wedges of Asian pear. 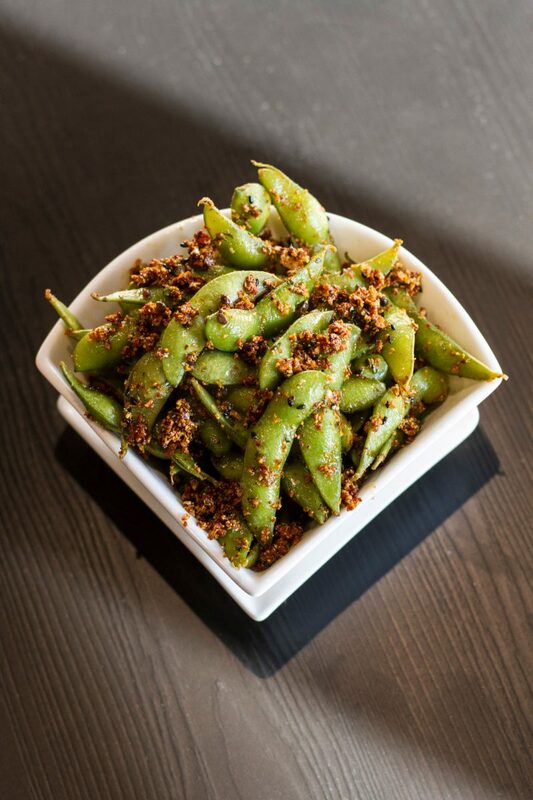 The edamame (above) consists of plump and vibrant hot beans sprinkled generously with a granular blend of garlic and shichimi pepper — also called shichimi togarashi. The Rising Sun sushi roll (below) encompasses battered-and-fried tempura green beans, tuna, and spicy mayo with Japanese scallops and orange chili sauce. The result was a starter that was at once sweet and sour, silky and crunchy, with the tiniest jolt of heat. Japchae-Pop pays homage to a Korean dish that uses potato-starch noodles, Trinh says. All I know is, at my table we battled over wads of galbi secreto pork, which were grilled at up to 800 degrees on a custom-designed gas-charcoal oven. The noodles, fresh vegetables and aged plum sauce — combined with tender pork — creates a rich, rounded dish. Equally satisfying was a soupy/stewy concoction called Goldentile. The namesake fish, steamed and fork-tender, was swimming in a yellow lemongrass-lobster broth laced with sambal chili and dotted with roasted baby carrots, dandelion greens and fresh herbs. I’m a sucker for lemongrass under any circumstances, and here the aromatic veggie was elevated to enchanting. I tried two sushi rolls, too. Rising Sun consisted of battered-and-fried tempura green beans, tuna, and spicy mayo with Japanese scallops and orange chili sauce. For old time’s sake, I also had the ceviche roll. I first tried one at Thornton Park’s Shari Sushi years ago, when Trinh helmed the kitchen there. The restaurant was a chic ground-breaker at the time. While neither roll had me swooning the way the Goldentile, the Japchae-Pop and the Madai Tasting did, sampling the perfectly lovely if not thrilling rice-and-fish rolls led me to engage Trinh in a discussion about rice. As you might imagine, this chef’s sushi rice — which is also used with all nigiri dishes — is made with exceptional thought. Essentially, Sushi Pop’s rice begins with Koshihikari premium sushi rice. Trinh mixes two different types of vinegar: red rice vinegar and white rice vinegar, which he pours over the hot rice as soon as it comes out of the pot. Then he adds a bit of kombu, which is cured kelp, plus salt and sugar. “The rice is a little bit salty and a little bit sweet,” he says. How can you not want to try that now that you know so much about it? As of press time, the only dessert on the Sushi Pop menu is the P.M.S., a molten chocolate cake with peanut-butter powder served with salted-caramel ice cream. Personally, it’s enough for me. But be aware that variety is on the way. Sushi Pop uses many of the same ingredients in its craft cocktails as in its food. The Ninja Chronicles (second from left), for example, is a blend of Kikori Whiskey, Pomelo Oleo (a citrus sweetener) and Xocolatl Mole Bitters with subtle cinnamon, cacao and spice elements. 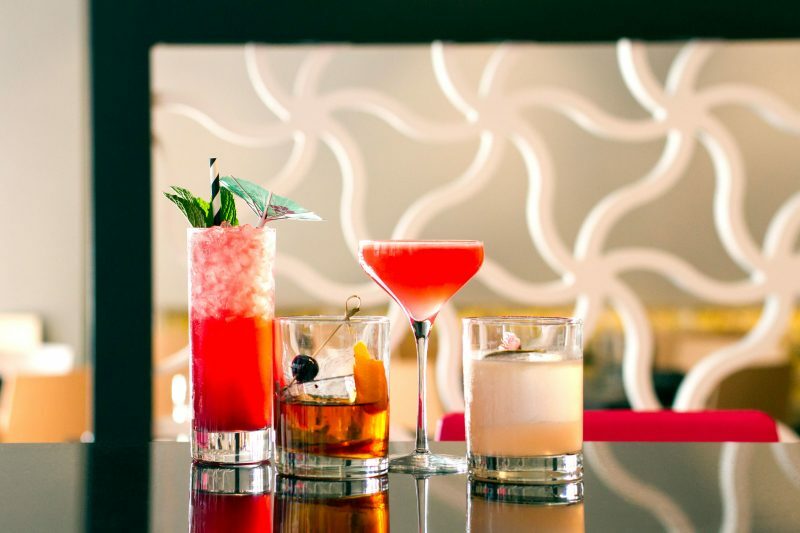 As for beverages, Sushi Pop uses many of the same ingredients in its craft cocktails as in its food — and these spirited sippers are designed to complement the dishes Trinh prepares. The Ninja Chronicles, for example, was simple but perfect with my meal. It’s a blend of Kikori Whiskey, Pomelo Oleo (a citrus sweetener) and Xocolatl Mole Bitters, with subtle cinnamon, cacao and spice elements. Don’t ask too many questions — trust the Sushi Pop team to do right by you behind the bar. The Winter Park location is more refined than its Oviedo counterpart, with no anime decorating the walls. The dining room is open with the sushi bar in middle. Artfully blurred wallpaper and banquette coverings add a touch of whimsy. Sushi Pop was so new during my visit that it hadn’t yet had its grand opening. But everything ran exceptionally well for a project-in-progress. Hopefully the service team will decide to plunk down a stack of small plates when groups share — or at least give each person one large dinner plate. Also, it would serve Sushi Pop well to be less pretentious with the written menu. 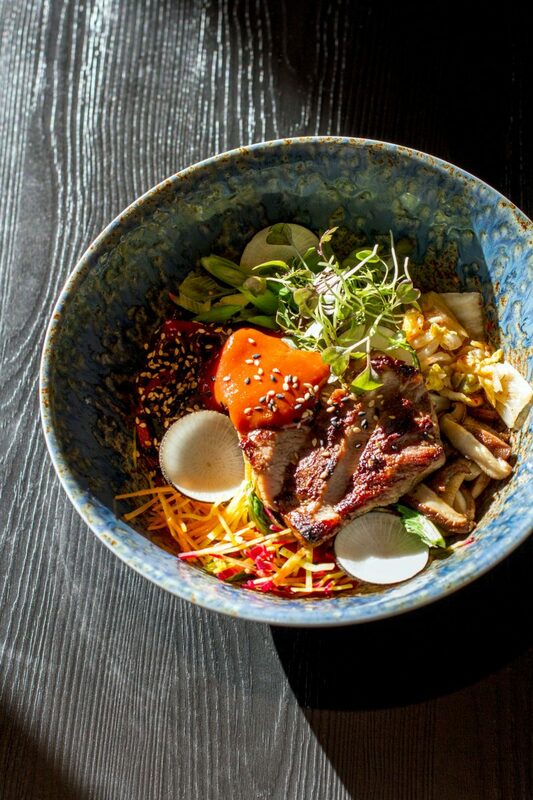 Each offering should be described in plain language rather than Asian foodie-speak. Example: the tachiuo dish was described like this: sanbaizu, kombu, cucumber, shiso, myoga, momiji, oboshi.” The only one I’m sure about is cucumber. Those issues are small purple potatoes and easily fixable as the new Sushi Pop matures. So I strongly suggest that you stop in. Even if you think you’ve tried it all, Trinh may surprise you with some tasty new tricks.